I am a computer scientist, researcher, and interaction designer. My research area includes Human-Computer Interaction (HCI) and Community Citizen Science (CCS), which focuses on designing, implementing, deploying, and evaluating interactive systems to support community engagement and democratize scientific knowledge. A formal definition of CCS is discussed in the introduction chapter of my Ph.D. thesis and the presentation video. Crowdsourcing/Participatory Sensing to engage communities in contributing user-generated content and collecting sensing measurements reliably. Data Visualization/Storytelling to enable communities to interactively explore data, identify patterns, form hypotheses, create narratives, and share findings. 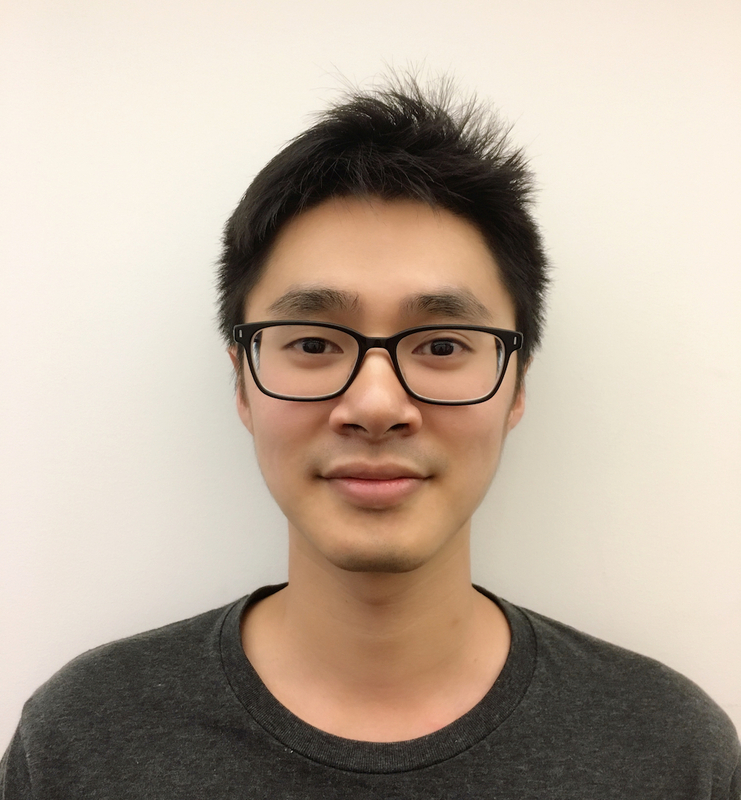 Machine learning/Computer Vision to assist communities in mining scientific knowledge and interpreting complex patterns from large-scale datasets. I received my Ph.D. degree in Robotics in 2018 from the Robotics Institute at Carnegie Mellon University (CMU). Previously, I received my Master's degree in tangible interaction design in 2012 from the School of Architecture at CMU, where I studied and built prototypes of interactive robots and wearable devices. Prior to CMU, I earned dual Bachelor's degree in both architecture and computer science in 2010 at National Cheng Kung University, Taiwan. Outstanding Student Academic Achievement. 2005, 2006, 2007. Department of Architecture, National Cheng Kung University, Taiwan. Third Prize, National Country House Design Competition. 2008. Ministry of the Interior, Taiwan. Best New Artist. 2009. The National Golden Award for Architecture, Taiwan. Webby People's Voice Award, Best Use of Video or Moving Image. 2014. International Academy of Digital Arts and Sciences, USA. Best Paper Honorable Mention Award (Top 5%). 2017. ACM CHI Conference on Human Factors in Computing Systems, USA. Best Paper Honorable Mention Award (Top 2.5%, 7 out of 282 submissions). 2019. ACM IUI Conference on Intelligent User Interfaces, USA. Yang-Ting Shen, Tay-Sheng Jeng, and Yen-Chia Hsu. 2011. A "Live" Interactive Tagging Interface for Collaborative Learning. International Conference on Cooperative Design, Visualization and Engineering (CDVE 2011). Springer. Yen-Chia Hsu, Tay-Sheng Jeng, Yang-Ting Shen, and Po-Chun Chen. 2012. SynTag: A Web-based Platform for Labeling Real-time Video. In Proceedings of the ACM 2012 Conference on Computer Supported Cooperative Work (CSCW 2012). ACM. Yen-Chia Hsu, Paul Dille, Randy Sargent, Christopher Bartley, and Illah Nourbakhsh. 2015. A Web-based Large-scale Timelapse Editor for Creating and Sharing Guided Video Tours and Interactive Slideshows. IEEE Information Visualization Posters, 2015. Yen-Chia Hsu, Jennifer Cross, Paul Dille, Illah Nourbakhsh, Leann Leiter, and Ryan Grode. 2018. Visualization Tool for Environmental Sensing and Public Health Data. In Proceedings of the 2018 ACM Conference Companion Publication on Designing Interactive Systems (DIS 2018 Companion). ACM. Yen-Chia Hsu. 2016. Industrial Smoke Detection and Visualization. Technical Report CMU-RI-TR-16-55. Robotics Institute, Carnegie Mellon University, Pittsburgh, PA.
Yen-Chia Hsu. 2018. SimArch: A Multi-agent System For Human Path Simulation In Architecture Design. arXiv preprint arXiv:1807.03760. Emiliano Huet-Vaughn, Nicholas Muller, and Yen-Chia Hsu. 2018. Livestreaming Pollution: A New Form of Public Disclosure and a Catalyst for Citizen Engagement. No. w24664. National Bureau of Economic Research, 2018. Yen-Chia Hsu. 2018. Designing Interactive Systems for Community Citizen Science. Ph.D. Dissertation. Technical Report CMU-RI-TR-18-29. Robotics Institute, Carnegie Mellon University, Pittsburgh, PA.
TIME. Jeffrey Kluger. 2013. Timelapse: Landsat Satellite Images of Climate Change. Pittsburgh Post-Gazette. Ashley Murray. 2017. Carnegie Mellon Scientists Use App to Track Foul Odors in Pittsburgh. PC Magazine. Michelle Donahue. 2018. Citizen Science: Do Try This at Home. Carnegie Mellon University News. 2013. Robotics Institute Helps Make Stunning Satellite Imagery Easily Accessible. Google AI Blog. 2013. Building A Visual Planetary Time Machine. Google Official Blog. 2013. A picture of Earth through time. Google Earth Engine. 2013. Earth Timelapse. Ars Technica. Sean Gallagher. 2013. 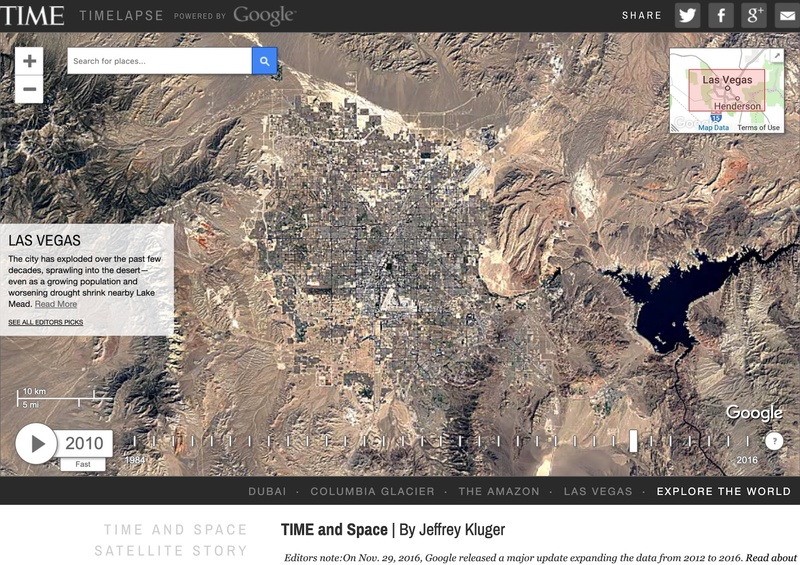 How Google built a 52-terapixel time-lapse portrait of Earth. Pittsburgh Post-Gazette. 2015. Pollution cam: Now the public has an eye on Shenango, 24/7. Carnegie Mellon University News. Byron Spice. 2015. Shenango Channel Provides Online Resource For Sharing Images, Data About Coke Plant. Pittsburgh City Paper. Ashley Murray. 2015. What you need to know about Pittsburgh news this week. Pittsburgh Post-Gazette. Don Hopey. 2015. Shenango Channel keeps an eye on the Neville Island sky. Pittsburgh Post-Gazette. Don Hopey. 2015. Regulators reviewing Shenango Coke Works' compliance with 2012 consent decree. HuffPost. Illah Nourbakhsh. 2016. A Community Advocacy Success Story. The Society for Social Studies of Science (4S). Gwen Ottinger. 2016. A Missing Link in Making Meaning from Air Monitoring?. Group Against Smog and Pollution. 2016. A Change in the Air After the Closure of the Shenango Coke Plant (another source). Allegheny Front. Lou Blouin. 2016. You Can Now Report Terrible Air in the 'Burgh with this New App. The Glassblock. Adam Shuck. 2016. If You Smell Something, Say Something: CMU Launches Mobile App Smell PGH. Toxic News. Gwen Ottinger. 2017. Lessons Learned from an Experiment in Infrastructuring. 90.5 WESA. Julie Grant. 2017. Life Smells Better After Shenango. NEXTpittsburgh. Amanda Waltz. 2017. What it was like "Living Downwind" of Shenango Coke Works. Greenapps&web. Judit Urquijo. 2017. Smell Pittsburgh, an example of app to report pollution by foul odors. Pittsburgh Post-Gazette. Stephen Riccardi and Beatrice Dias. 2017. Smelly air? There's an app for that. TechCrunch. John Biggs. 2017. Smell PGH Lets You Report Weird Smells in Pittsburgh. Carnegie Mellon University News. Byron Spice. 2017. Smell PGH App Helps Pittsburghers Report Foul Odors. Fast Company Co.Design. Mark Wilson. 2017. Does Your City Literally Stink? There's An App For That. Grantcraft. Philip Johnson. 2017. Using Low-Cost Technology to Democratize Data and Protect Public Health. Pittsburgh Tribune-Review (TribLIVE). Matthew Santoni. 2017. California Towns Adapt Carnegie Mellon's Smell Pittsburgh App. NEXTpittsburgh. Amanda Waltz. 2017. Environmental activists are using Smell PGH and other tech to unstink Pittsburgh, and so can you. NEXTpittsburgh. Amanda Waltz. 2017. CREATE Lab clears the air with improved Smell PGH app and new website. Lawrenceville United. David Breingan. 2017. Joint Comments from LU and LC on Draft Operating Permit for McConway and Torley. Pittsburgh Post-Gazette. Anna Garner. 2017. The Smell PGH app helps track air pollution. PSFK. Zack Palm. 2017. A New Platform In Pittsburgh Lets Citizens Report Foul Smells. StateScoop. Jason Shueh. 2017. A whiff of citizen engagement powers Pittsburgh's new air pollution app. Pittsburgh Post-Gazette. Rachel Filippini. 2018. Allegheny County must crack down on odor emissions violations. Allegheny Front. Kara Holsopple. 2018. Turns Out Air Pollution Makes for Good Listening. NEXTpittsburgh. Melissa Rayworth. 2018. Once again, Pittsburgh air ranks among the worst. Here's what you can do about it. PublicSource. Teake Zuidema. 2018. Will Pittsburgh flourish as a hub of eds and meds or gas and petrochemicals? Can we have it both ways? ProMarket. Emiliano Huet-Vaughn, Nicholas Z. Muller, and Yen-Chia Hsu. 2018. Livestreaming Polluters to Enforce Environmental Policy: Evidence from a Natural Experiment in Pittsburgh. Pittsburgh Tribune-Review (TribLIVE). Theresa Clift. 2018. Environmental groups pressure Allegheny County officials to crack down harder on polluters. Pittsburgh Post-Gazette. Don Hopey. 2018. Air advocates read "scroll of smells" at health board meeting. Pittsburgh Tribune-Review (TribLIVE). Theresa Clift. 2018. Allegheny County Health Department defends air quality efforts, plans stricter coke plant rules. Hack The Grid. Andrea Polli. 2018. Hack The Grid. Environmental Health News. Kristina Marusic. 2018. ER visits for asthma dropped 38% the year after one of Pittsburgh's biggest polluters shut down. World Economic Forum. Illah Nourbakhsh. 2018. Introducing EarthTime: animations which show how our planet is changing. Yen-Chia Hsu. A Web-based Platform for Labeling Real-time Video. Computer software. Yen-Chia Hsu. A Multi-agent System for Human Path Simulation In Architecture Design. Computer software. Yen-Chia Hsu. A Wearable Shoe-Integrated Interaction Interface. Computer software. Yen-Chia Hsu. A HTML/CSS Template for Building Projects or Personal Websites. Computer software. CMU CREATE Lab. A Web-Based Interactive Viewer for Visualizing Large-Scale Timelapses. Computer software. CMU CREATE Lab. Visualization Tool for Environmental Sensing and Public Health Data. Computer software. CMU CREATE Lab. A Mobile Application to Crowdsource and Visualize Pollution Odors. Computer software. CMU CREATE Lab. Earth Timelapse Viewer. Computer software. CMU CREATE Lab. Predicting and Interpreting Smell Data Obtained from Smell Pittsburgh. Computer software. CMU CREATE Lab. A tool for labeling video clips (both front-end and back-end). Computer software. I worked with a community to develop an air quality monitoring system, which provides evidence with videos, air quality data, and smell reports. The system uses computer vision to generate a series of animated smoke images, which serve as scientific evidence of pollution for community advocacy. SimArch uses Markov Decision Process to build a behavior model. The model simulates mental states, target range detection, and collision prediction when agents behave in a museum. SimArch outputs the prediction of how likely a person will occur in a location after simulation. SENSEable Shoes is a platform for interaction designers to create applications. 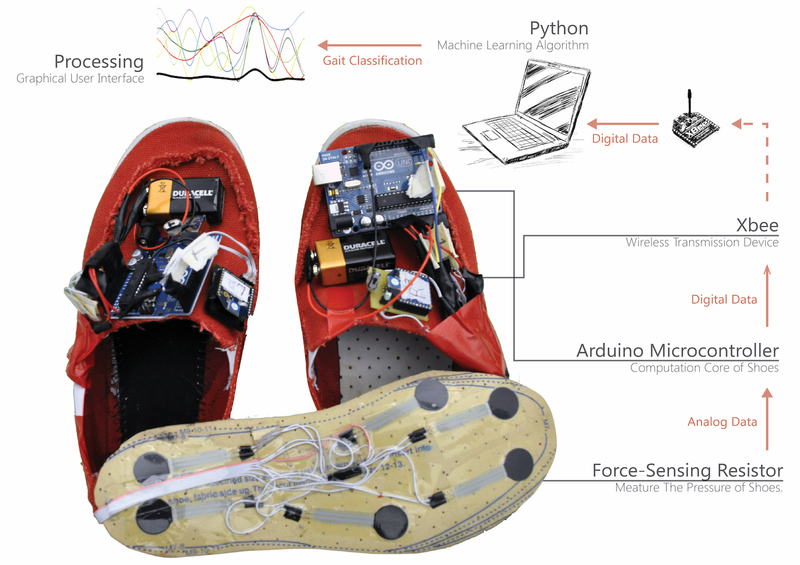 It recognizes low-level activities by measuring the weight distribution over the feet with sensors embedded in the shoe pad. A Support Vector Machine classifier identifies mobile activities and foot gestures. What does music look like? Draw-o-lin is an interactive mobile robot visualizing music by drawing graphs on a paper according to various sound properties. Violin performers control the robot by playing various pitches, alternating the volume, and changing the tempo of the music. Users can label Good, Question, and Disagree tags in real or non-real time with visualization of time-stamp video previews on an interactive timeline. SynTag creates thumbnails by using real-time tags for presenters to receive instant feedback and for others to retrieve videos.